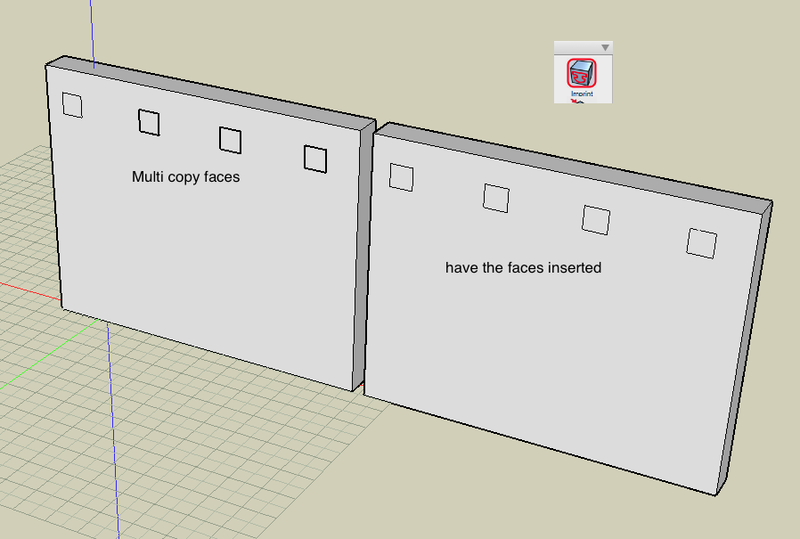 I just tried duplicating a rectangle on a face of a larger object (think... windows) and found that while the first rectangle is inserted, all duplicated become separate objects. Is there a way to duplicate geometry and have it remain inserted? I don't see a way to do what you want directly, best alternative I have found is make your transform as you want, then using the "slice" tool. select your wall, then your want to be window. One problem, the slice tool, does not follow the "ghost, delete, Keep operands," settings. it always keeps, so you will need to delete it or ghost it manually. I know it isn't what you are looking for, but hopefully it helps. ﻿ Is there a way to duplicate geometry and have it remain inserted? I assume you want to have several inserted faces on the face of your big object. And you want to create them from one you already have inserted there. As far as I have an experience with FormZ it usually understands that you want to have a copy of selected geometry to be the new objects but not the parts of the objects they belonged to. I believe it is developed this way in order to be safe from creating bad geometry and still to be capable to perform tasks with selected geometry. If I would be you I`d make those faces copies as separate objects and consequently inserted them onto desired face. I understand that is not as straightforward workflow yet should do the task. Thanks guys. A little surprising, but I'll work around it.